Earn $54.31 in Rewards credit (5431 points) What's This? 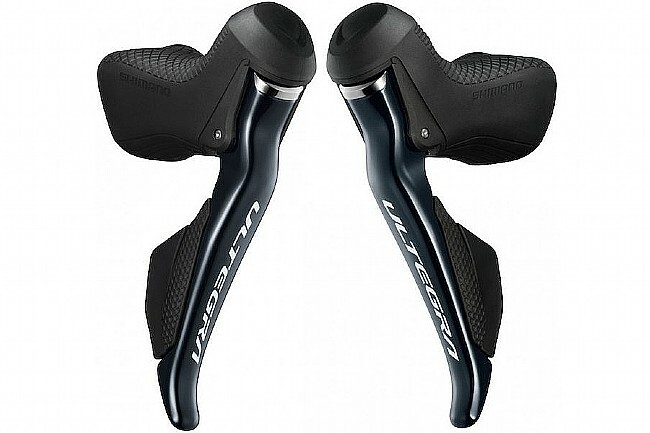 Updating their ever popular Ultegra Di2 line of electronic shifting, the Ultegra ST-8070 Di2 Shift/Brake Levers offer an updated and improved design with hydraulic disc brake compatibility. Providing a Di2 shifter that offers more intuitive shifting and braking, the ST-R8070 set out to provide stress and worry-free cycling through crisp, reliable performance. With its hydraulic disc brake compatibility, take the improved ergonomics and nearly instantaneous shifting off road. Benefiting from improved ergonomics, the ST-R8070 feels great in all riding positions, offering a solid, stable platform and reach-adjustable lever operation. The shift buttons themselves have received an updated, featuring a clearer separation between buttons with a more defined response on activation making it easy to locate and operate, even with heavy winter gloves. Further, each shift button can be programmed for multi-shifting via Shimano's e-Tube project. The Shimano Ultegra ST-8070 Di2 Shift/Brake Lever is compatible with 2x11 speed drivetrains and hydraulic brake systems. Claimed weight: 180 grams per shifter.